Union Finance Minister Arun Jaitley on Tuesday said the demand of textile traders to exempt fabrics under the Goods and Services Tax (GST) system cannot be met with as manufacturers will then not be able to claim credit of tax on previous stages. "The GST rate structure for the textile sector was discussed in detail in the GST Council, wherein it recommended the detailed rate structure for the sector. Nil GST on fabrics will break the input tax credit chain and the garment manufacturers will then not be able to get credit of tax on previous stages," Jaitley said in a written reply in the Rajya Sabha. Jaitley said nil GST on fabrics will result in zero rating of imported fabrics, while domestic fabrics will continue to bear the burden of input taxes. The textile industry has been demanding exemption under the GST, saying that the sector has never been taxed. They are claiming that fabric will become 10-12 percent expensive under the new regime due to the tax rate as well as the compliance cost, making the Indian textiles globally uncompetitive. "It is not correct to say that textiles sector was never taxed in Independent India. 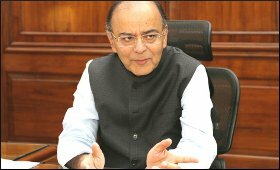 In fact, during 2003-04, the sector was subjected to central excise duty," Jaitley said. The Minister assured that the GST rates are equal or lower than the pre-GST tax incidence and the price of fabrics are not likely to go up. "The organised traders and unorganised sellers in textile sector have not been affected by GST. The GST rate structure for the textile sector enables ease of classification and determination of rate," he said. Garments not exceeding Rs 1,000 per piece have been put under 5 percent GST bracket while those above have been placed in the 12 percent slab. "Necessary steps have been taken to facilitate taxpayers to take GST registration. GST Sewa Kendras have been set up in various centres to handhold the taxpayers and to provide all necessary guidance regarding GST compliance," he said.